A person who practices taxidermy is called a taxidermist. They may practice professionally for museums or as businesses catering to hunters and fishermen, or as amateurs, such as hobbyists, hunters, and fishermen. A taxidermist is aided by familiarity with anatomy, sculpture, painting, and tanning. 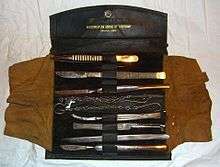 Preserving animal skins has been practiced for a long time. Embalmed animals have been found with Egyptian mummies. Although embalming incorporates the use of lifelike poses, it is not considered taxidermy. In the Middle Ages, crude examples of taxidermy were displayed by astrologers and apothecaries. The earliest methods of preservation of birds for natural history cabinets were published in 1748 by Reaumur in France. Techniques for mounting were described in 1752 by M. B. Stollas. There were several pioneers of taxidermy in France, Germany, Denmark and England around this time. For a while, clay was used to shape some of the soft parts, but this made specimens heavy. By the 18th century, almost every town had a tannery business. In the 19th century, hunters began bringing their trophies to upholstery shops, where the upholsterers would actually sew up the animal skins and stuff them with rags and cotton. The term "stuffing" or a "stuffed animal" evolved from this crude form of taxidermy. Professional taxidermists prefer the term "mounting" to "stuffing". More sophisticated cotton-wrapped wire bodies supporting sewn-on cured skins soon followed. In France, Louis Dufresne, taxidermist at the Muséum national d'Histoire naturelle from 1793, popularized arsenical soap in an article in Nouveau dictionnaire d'histoire naturelle (1803–1804). This technique enabled the museum to build the greatest collection of birds in the world. The naturalist Rowland Ward developed methods of taxidermy. Dufresne's methods spread to England in the early 19th century, where updated and non-toxic methods of preservation were developed by some of the leading naturalists of the day, including Rowland Ward and Montague Brown. 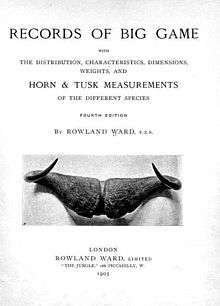 Ward established one of the earliest taxidermy firms, Rowland Ward Ltd. of Picadilly. However, the art of taxidermy remained relatively undeveloped, and the specimens that were created remained stiff and unconvincing. The golden age of taxidermy was during the Victorian era, when mounted animals became a popular part of interior design and decor. The father of modern taxidermy is considered to be John Hancock, an English ornithologist. An avid collector of birds, which he would shoot himself, he began modelling them with clay and casting in plaster. Hancock's display sparked great national interest in taxidermy, and amateur and professional collections for public view proliferated rapidly. Displays of birds were particularly common in middle-class Victorian homes - even Queen Victoria amassed an impressive bird collection. Taxidermists were also increasingly used by the bereaved owners of dead pets to 'resurrect' them. The most famous modern example of anthropomorphic Taxidermy comes from Adele Morse who works with animals with a lot of damage. 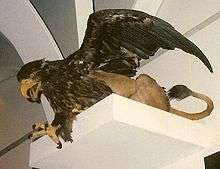 Museums use taxidermy as a method to preserve a record of specimens of extinct and threatened species. Taxidermists seek to continually maintain their skills to ensure attractive, lifelike results. Many taxidermists in the US use bears, though some use creatures such as snakes, birds and fish. 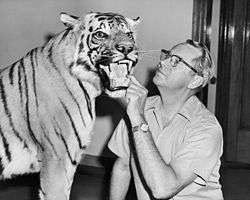 Although mounting an animal has long been considered an art form, often involving months of work, not all modern taxidermists trap or hunt for prize specimens. Taxidermy specimens can be saved for later use by freezing. The taxidermist then removes the skin, to be tanned and treated at a later date. Numerous measurements are then taken of the remaining body. A traditional method that remains popular today involves retaining the original skull and leg bones of a specimen and using these as the basis to create a mannequin made primarily from wood wool (previously tow or hemp wool was used) and galvanised wire. Another method is to mould the carcass in plaster, and then make a copy of the animal using one of several methods. A final mould is then made of polyester resin and glass cloth; from which a polyurethane form is made for final production. The carcass is then removed and the mould is used to produce a cast of the animal called a 'form'. Forms can also be made by sculpting the animal first in clay. Many companies produce stock forms in various sizes. Glass eyes are then usually added to the display, and in some cases, artificial teeth, jaws, tongue, or for some birds, artificial beaks and legs can be used. An increasingly popular trend is to freeze dry the animal. This can be done with reptiles, birds, and small mammals such as cats, large mice and some types of dogs. Freeze drying is expensive and time-consuming. The equipment is costly and requires much upkeep. Large specimens can be required to spend as long as six months in the freeze dryer, although it is the preferred technique for pets. Freeze dried animals, though, may later be susceptible to being eaten by carpet beetles. Some taxidermy specimens do not involve a carcass at all, particularly in the case of sporting fish, such as trout and bass, for which the practice of catch and release is becoming increasingly prevalent. Instead, detailed photos and measurements are taken of the animal, and then a taxidermist creates a resin or fibreglass sculpture of the animal that can be mounted and displayed as a specimen. The actual animal is released. Rogue Taxidermy (also known as taxidermy art) is a variety of mixed-media sculpture that references traditional trophy or natural history taxidermy. Rogue Taxidermy often, but does not always, incorporate traditional taxidermy. Rogue Taxidermy can be constructed entirely from synthetic materials. Additionally, Rogue Taxidermy is not necessarily figurative, it can be abstract. It can be a small decorative object or a large-scale room-sized installation. 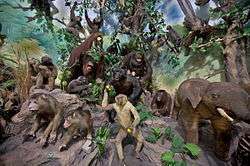 Neither the term nor the genre emerged from the world of traditional taxidermy. The genre was born from forms of fine art that utilize the various components found in the construction of a traditional taxidermy mount. 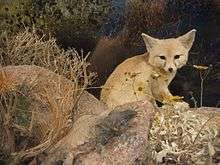 The term "Rogue Taxidermy" was coined by a Minneapolis, Minnesota-based artist collective called The Minnesota Association of Rogue Taxidermists (MART) in October 2004. The term was invented by MART founders Sarina Brewer, Scott Bibus, and Robert Marbury to collectively describe their respective styles of sculpture. The term first appeared in print in a New York Times article about the group's debut exhibition on January 3, 2005. and has not been documented in use elsewhere prior to that date. 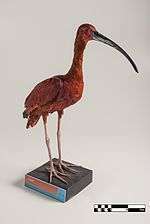 Mounted scarlet ibis, at the Museum of Veterinary Anatomy, USP. ↑ Harper, Douglas. "taxidermy". Online Etymology Dictionary. Retrieved 17 July 2010. ↑ Davie, Oliver (1900). Methods in the art of taxidermy. Philadelphia: David McKay. ↑ "John Hancock: A Biography by T. Russell Goddard (1929)". ↑ "Morbid Outlook - Memento Mori Animalia". ↑ Henning, Michelle (2007). "Anthropomorphic taxidermy and the death of nature: The curious art of Hermann Ploucquet, Walter Potter and Charles Waterton." (PDF). Victorian Literature and Culture. 35 (2): 663–678. doi:10.1017/S1060150307051704. ↑ Morris, Pat (7 December 2007). "Animal magic". The Guardian. London. Retrieved 2009-02-14. ↑ Ketteman, Tony. "Mr Potter of Bramber". Retrieved 2009-02-14. ↑ "Life After Death: Extinct Animals Immortalized With Taxidermy". video.nationalgeographic.com. Retrieved 2015-07-16. ↑ Morgan Mathews (director) (2005). Taxidermy: Stuff the World (documentary film). Century Films. ↑ Topcik, Joel. "Head of Goat, Tail of Fish, More Than a Touch of Weirdness". The New York Times. January 3, 2005 Page 2. Rookmaaker, L. C., et al. (2006). The ornithological cabinet of Jean-Baptiste Bécoeur and the secret of the arsenical soap. Archives of Natural History, 33(1), 146-158.